Located in a very quiet corner of Truman Annex, this condo is a perfect getaway. This one bedroom and one bathroom unit has a spacious balcony on the 2nd floor deck. In case you would like to work on vacation the unit has a wireless DSL connection. There is one assigned parking space per unit. 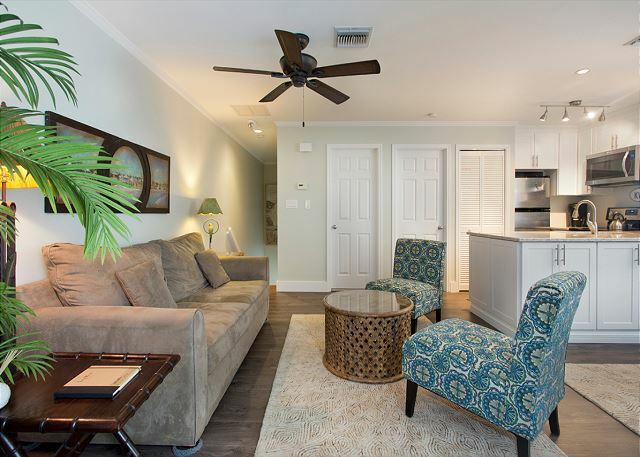 Enjoy a dip in the pool, a quick walk to Ft Zachary Taylor Park & Beach or Historic Old Town Key West-all within minutes of this perfectly located Shipyard condo. The proximity to Truman's Little White House, along with the fact that you are only two blocks from either Mallory Square where the nightly Sunset Celebration occurs or two blocks from Sloppy Joes, which of course is the hub of any and all downtown activities, adds convenience to the exclusive, safe and tranquil Annex property. Whatever you choose to do, save your money on a rental car- everything is just a walk or bike ride away! So whether you are looking to party or just relax and enjoy the laid-back atmosphere of funky, historic Key West, this is the place! 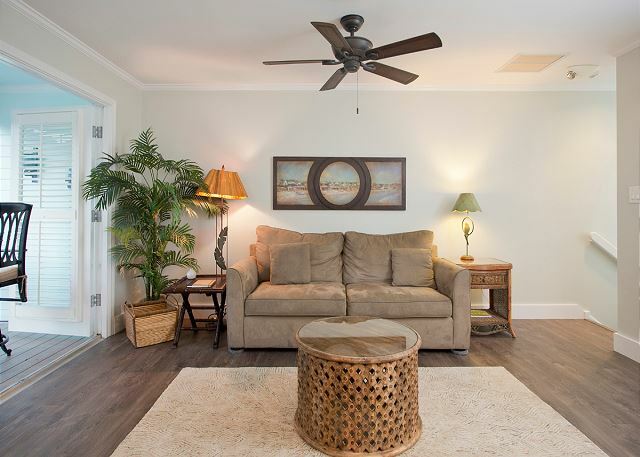 Our fully-equipped, comfortably furnished condo is sure to meet your every need. It's a perfect "home away from home". So rev up the blender, grab your shorts and sandals, and head south. Great condo in Truman Annex. Hello Bruce, Thank you for your feedback, we appreciate your repeat business. One of the loveliest Shipyard units we've ever stayed in. 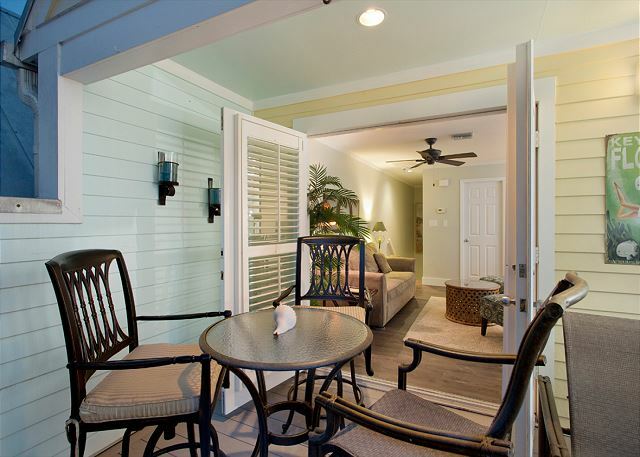 Perfect location - accessible to pool, Waterfront Park, the Green Parrot and other watering holes and restaurants. A glorious vacation spot. We'll be back. Hello David, We are glad to hear you enjoyed your stay. Thank you for your feedback. Come back again soon. The pictures does do justice to what this place looks like. The perfect little getaway with a great community. From a bike ride away from Duval Street and Fort Zackary you cant beat the location. Once we arrived we got some groceries and rented some bikes and the rest was vacation mode. You can tell the owner keeps everything up to date and gives the best directions. I definitely felt like I was home with a this place. I would highly recommend this to any couple from 28 to 100 years old. Key West Vaction was excellent as well, they were helpful on how to get to the property and gave us everything we need. Only thing I recommend is check into the property and then make a list of groceries and supplies you want. Little things like dish soap, sandwich bags, and sun screen is some of the things we needed. The big chain grocery stores are a drive away. My wife mention if you like your “stronger” hair dry bring you own. She said there’s works fine but I guess some women like a powerful one. If you want a nice close beach we recommend riding your bike to Fort Zackary. Its 2.50 a person (for the whole day) and they even have a little cafe with drinks and food. You can also rent a umbrella and two chairs for 30 bucks. Nice little place to snorkel for fish by the rocks and lay out and get a tan. The quick ride back to the place was perfect. Hello Edward Thank you for your feedback, we greatly appreciate it. We are glad you enjoyed your stay and hope to see you again in the near future. Great Little space in a very good location. Beware of added costs and rental requirements such as, cleaning fee,doing laundry and making sure all trash is emptied. Stairs may be difficult for elderly or physically challenged persons. Hello, Glad you enjoyed your stay! Hope to see you again soon Loren. There are no added cost. You are not required to do laundry we only ask that you take the garbage out and start the dishwasher. Exactly as described, very comfortable with nice layout inside. Deck large with covered area (we had some rain) Wish it was mine. Hello Randy, Glad you enjoyed your stay. Hope to see you again in the near future. We were very pleased with the accommodations. It was within walking distance of the Old Town highlights. We would stay here again! Hello Kate, Thank you for your review, we are happy you enjoyed your stay. Come back and see us again soon. the condo was just perfect and in the perfect location. The a/c didn't work the first day and the ice maker wasn't working right. Also I mentioned someone needs to professionally clean the dryer vent - it's going to cause a fire! Other than that, we were very happy. This condo is fully updated, nicely decorated, clean, and so close to everything. Its just the right size for 2 people. Hello Carol, Thank you for your repeat business. Perfect location...you can walk almost anywhere you want in 15 minutes or less...very clean and comfortable. Would DEFINITELY stay here again. Everything was fine with a hitch or two. We had a nice time. Hello Bruce. Glad you enjoyed your stay. Hope to see you again. Being a first time visitor to KW I spent a lot of time researching rental properties. This is the one I kept coming back to,and now I know why. The pictures and description of the property were spot on. The unit is perfect for 2 people, very comfortable bed, nice furnishings, great shower, wonderful and large deck to relax . The location being only 3 blocks from Duval St. affords you many options. Once you get back to the unit it seems as if you are miles away from all the action. Without hesitation I would recommend this property. Hello Bob, Thank you for your feedback we greatly appreciate and glad you enjoyed your first time to Key West. Come back and stay with us. Absolutely wonderful. Loved the condo, perfect for my husband and I. Very relaxing and close to everything. Wonderful way to begin the New Year. Hope to be back and would love to stay here again. Hello Joan, Thank you for your feedback it is greatly appreciated. Hope you come back too. We couldn't have wished for a better place to stay. This is a second floor condo, so anyone with difficulty climbing stairs should look elsewhere. A lot of add-on costs added about $400 to the bill, which is not indicated in initial rental price. Damage protection and booking fees added $69 to bill. Taxes were high at $254. Cleaning charge of $90 seemed high too considering we were responsible for making sure all trash was removed and dishes cleaned prior to leaving. So when looking at price point, be sure to factor in all the extra charges. This condo was super comfortable and our oasis after long days of sightseeing. Lots of towels were provided, which was appreciated. We would stay here again. Hello Terri, Thank you for your feedback, we greatly appreciate it. Some of the charges that were added on were from HomeAway which are their charges when you book online. We do charge $34 for damage protection security deposit waiver, if you choose, instead of the $1,000 security deposit and we charge a $35 booking fee. Taxes are 12.5% which includes sales tax and county bed tax. The $90 cleaning fee is a departure cleaning fee, we have the unit completely cleaned, linens, balconies etc... Hope to have see you again soon. Thank you for your review, we greatly appreciate it. Best time in key west ever. We have been coming for years but this has been the best location and the nicest accommodation. Will definitely consider the shipyard for a longer stay in the future. The double bed could have been more firm.. However, we were so busy during our stay, we were tired and slept well in spite of this . Hello Jeanne, Thank you for your feedback, we greatly appreciate. Hope to see you again soon. 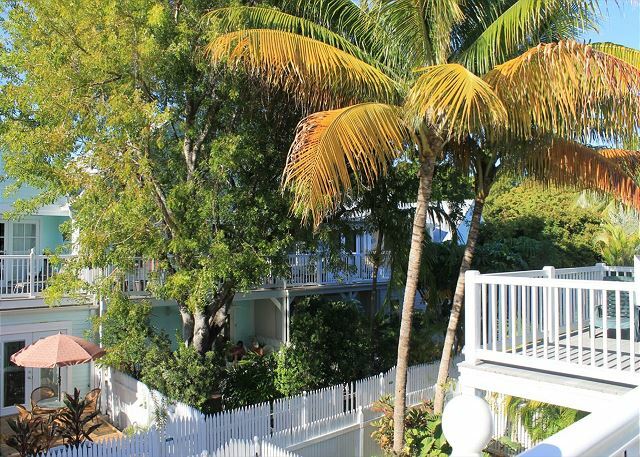 Everything You could want in Key West! It is hard to imagine a rental being more perfectly located than this one. Near the end of Southard in the Shipyard Condos it is 3 blocks from Duval and a 15 minute walk to the Zachary Tailor Fort and beach. It has its own community pool, heated, which, although it can get crowded is usually accessible. The condo still shows like it is freshly refurbished and contains most everything that you could want. The unit itself is a little dark, but not excessively so. Given the closeness of things to do, you probably won't spend that much time there anyway! The furniture is fairly comfortable although the bed was a little hard for my liking. Still, we managed to sleep very well so again was probably a matter of preference. The neighborhood is very quiet despite the closeness to Duval and the traffic to and from the park. The beauty of the Truman Annex is incredible to just walk through. While there are little things that could be better, I wouldn't hesitate to rent this unit again, nor would I hesitate to recommend it to others. Note that the unit is on the second floor so if you have trouble with stairs, probably not for you. Hello Steven, Thank you for your feedback we greatly appreciate it. Hope you stay with us again soon. Lovely place in Key West. We enjoyed staying in the condo. The decoration is lovely and the community is very nice. Our only complaint is that some of the renter around us got loud a few nights. Other than that we are coming back next February. Hello Bruce, Thank you for your feedback. See you next year! 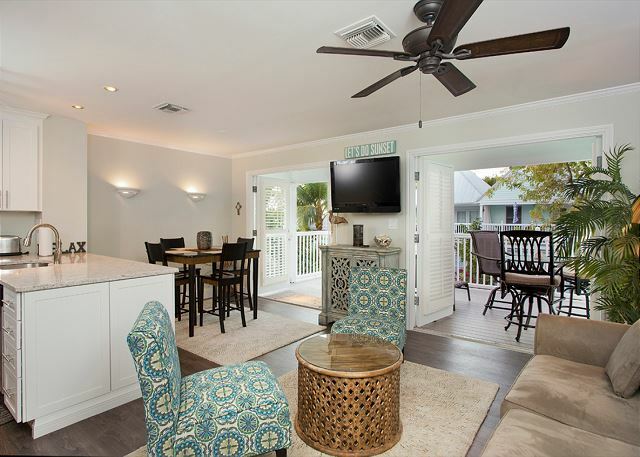 We couldn't have been happier with the Shipyard 106-2 condo in Key West. Great location near the state park beach, downtown, beautiful, quiet Truman Annex neighborhood. Upstairs condo was wonderful- private end unit, clean, spacious,tastefully updated, washer dryer, nice kitchen,great porch. Property management staff were great from booking to checkout. Loved this spot! Would recommend to anyone! Hello Michael, We are glad to hear you enjoyed your stay. Hope you come back and stay with us again. We stayed here for 7 nights and couldn't have been happier with our choice. We loved the location - walking distance to many bars and restaurants, Mallory Square, etc., but yet in a tranquil neighborhood. The only thing disturbing the peace at night was a rooster; otherwise it was a nice, quiet place to stay. The condo was well equipped and we loved having a kitchen to cook our own meals if desired. Lastly, KW Vac Prop & Realty was great to work with! Hello Mindy, We are glad you enjoyed your stay. Hope to have you come back soon. This newly renovated cottage is on the 2nd floor in Truman Annex. It's a lovely walk or leisurely bike ride to all the best attractions, including Fort Zachary Taylor beach (the best on the Key), the Green Parrot, Martin's, Vine-O, La Te Da, and Blue Heaven, to name just a few of our favorites. We highly recommend staying here if you get the chance. Hello Candy, Thank you you for your feedback, glad you enjoyed your stay. Hope to see you again soon! I will definitely be staying again! Hello Chantel, Glad you enjoyed your stay. We hope to have you stay with us again soon. We stayed at the Shipyard in the Truman Annex and loved it. 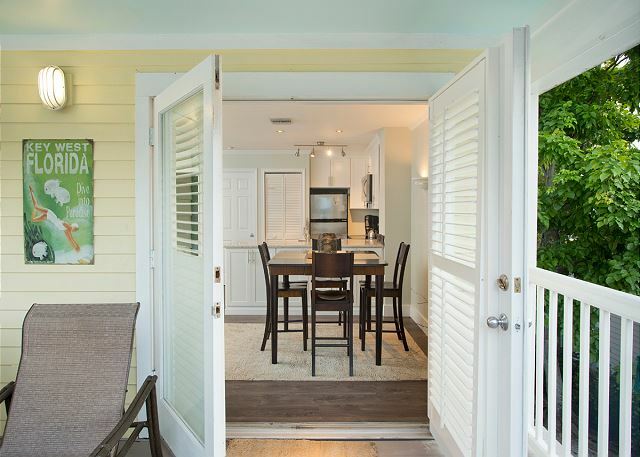 It is the perfect location for access to the beach at Fort Zachary State Park and Duval Street. The condo was beautiful and comfortable and perfectly appointed so that we could cook if we wanted. We would be happy to stay here again. Hello Namita, Glad you enjoyed your stay! Hope to see you again soon. This is the best location….close to the beach and to town. A car isn't necessary. We obviously love it, this was our third year. Just a few suggestions….New sand sand chairs are needed. We've used the same rusty ones for three years and they are hard to open and close. A full length mirror would be greatly appreciated. Since we both like to read in bed, a light on each night table would be good. We moved one from the living room into the bedroom. Since my husband and I aren't glued at the hip. an extra key would be helpful. We loved the remodel and we're looking forward to our stay in 2016. Hello Jennifer, Thank you for your feedback we greatly appreciate it. We would have loved to address your suggestions during your stay had we been made aware of it as we are not in the business to inconvenience our guest. Beach chairs are not something we provide, sometimes owners or past guest leave them there and we did not know about those but will look into that, thank you. The owner gives us one set of keys for the amount of bedrooms each property has but we will bring this to their attention. See you in 2016 and we greatly appreciate your repeat business. This is a beautiful condo in a quiet area, convenient to everything. We could walk wherever we wanted to go. Nice relaxing by the pool after a day at the beach. The condo is well maintained and clean, bright, and has a great deck for dining/relaxing. The kitchen is tiny and needs better knives and a cutting board, and we were lacking sheets for the pullout sofa. We would definitely stay here again! Keys were in a lockbox so it was easy to check in at our convenience, and the guard at the Truman Annex was helpful in showing us where our unit and assigned parking were. Excellent dinners at 915 Duval and Blue Heaven(the best key lime pie!). Hello Joanne, Thank you for your feedback we would have addressed any issues that would have come up while you were here if I had been made aware of it then. We are not in the business to ruin or inconvenience your stay in any way. Glad you enjoyed your stay and hope to have you stay with us again in the future. Well appointed 1 bedroom apartment with deck. Great location with a short walk to Duvall street but far enough away so no noise! Hello William, Nice to hear from you. Glad you enjoyed your stay. Hope to see you again next year! My husband and I had a wonderful experience staying in the Truman Annex property. We rented bikes for the week and loved being close to downtown. Hello Cathy, Glad you enjoyed your stay. Hope to have you stay with us again in the near future. Truman Annex is a great place to stay! The condo was beautiful, homey, well stocked with towels, beach chairs, kitchen items. I had breakfast on the patio every morning, and we could walk everywhere. A delightful vacation! Hello Mary, Glad you enjoyed your stay. Hope to have you stay with us again. We had a great time. The condo was close to everything and very clean. Hello Richard, Glad you enjoyed your stay and hope to have you stay with us again. We've stayed in a few places in the Shipyard and this condo was a great location and had a wonderful (HUGE!) deck. The living area was open. Kitchen is dated but had decent amenities. Bedroom is small. Loved where this was in the Shipyard - very close to the pool! Hello Casey, Glad you enjoyed your stay and hope to see you again soon. Good location. 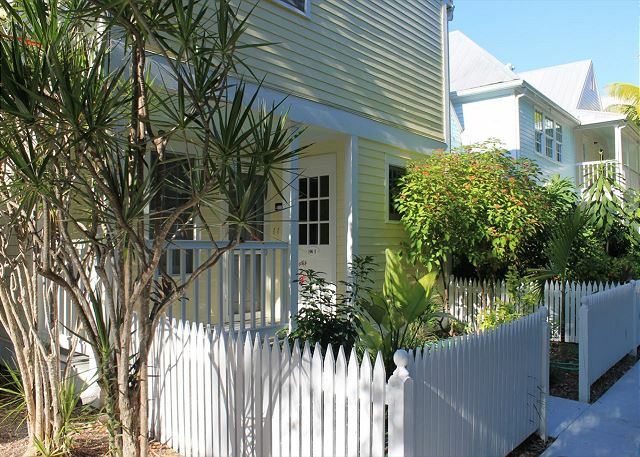 Walking distance to Duval St., Truman White House, Hemingway House, and restaurants. Condo was large enough for two people, nicely decorated and had all the amenities needed for an extended stay. There were a couple of minor maintenance issues, but not enough to distract from overall impression. Truman Annex is well maintained, with lush landscaping, and well lighted walkways. We would recommend to anyone seeking a relaxed, quiet getaway, that is still near the action. Hello Richard, Glad you enjoyed your stay. Hope to see you again soon. We found this property through TripAdvisor. 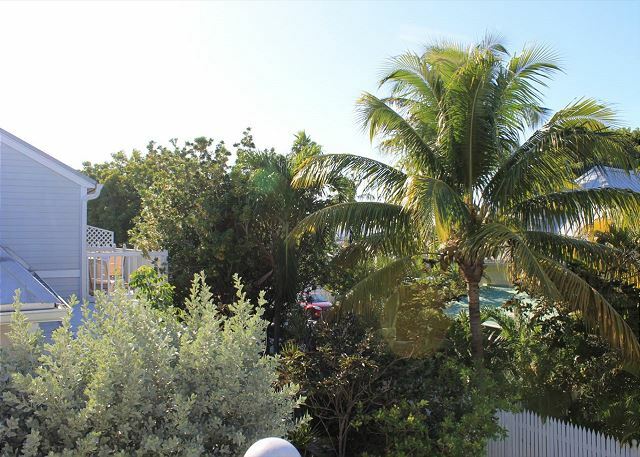 The description of the property was accurate except for this; "a lovely view of the Key West Harbor". We were expecting a water view of the harbor, not a partial view of the U.S. COAST GUARD CUTTER INGHAM. (A permanent(?) museum piece docked at the harbor.) Other than this, we were completely satisfied. Hello ****, Thank you for the feedback, we appreciate it and have contacted the websites so that they remove the wording from the description. Hope to have you stay with us again with your next stay to Key West. Hello ****, Thank you for the feedback, we appreciate it and have taken the necessary measures to make sure the wording is removed from the description. Hope to have you stay with us again with your next stay to Key West. Hello, Thank you for the feedback, we appreciate it and have contacted the websites to advise them to remove the wording from their description. Hope to have you stay with us again with your next stay to Key West. Highly recommenend this place especially for those on first visit to Key West. The rental agency was very professional and friendly with smooth transactions. 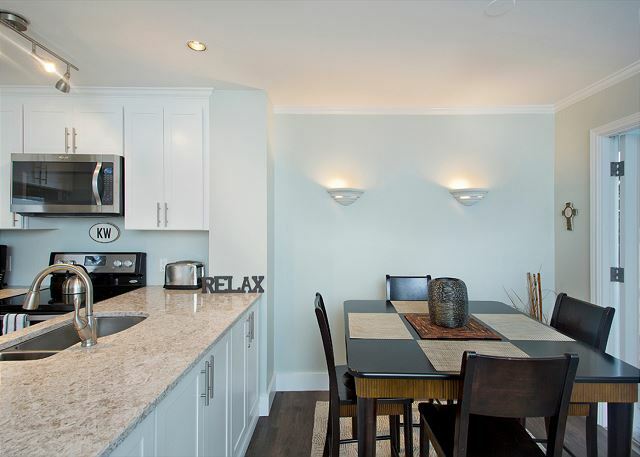 In really nice and safe area as well walking distance to most attractions including beach. 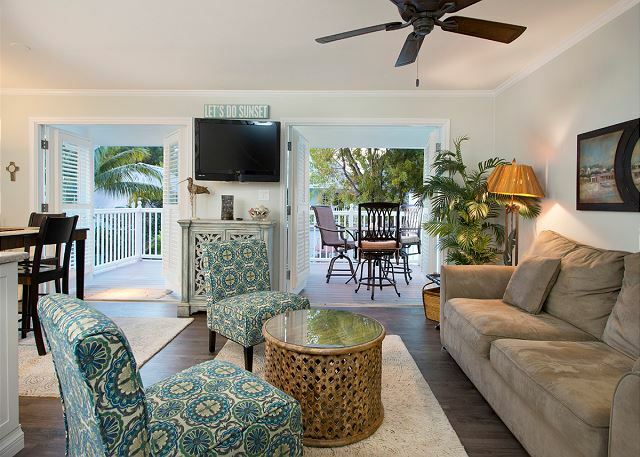 The apartment is really cute, laidback, and comforting like Key West itself!! Book as soon as you can!! Hello Migdalia, Glad you enjoyed your stay. Hope to have you and your family stay with us again in the near future. We have stayed in this unit several times. This time we spent a month. Being there for a month we spent alot of time in the unit and everything was wonderful. I cooked alot and not once did I wish I had something, the kitchen is well stocked. The internet was wireless and fast. The flat screen TV in both the living room and bedroom were very nice. The bed is Queen size and is very comfortable. 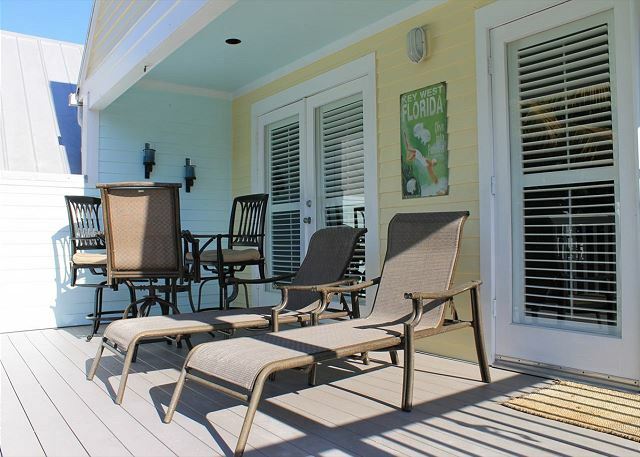 We love the oversize deck with 2 lounge chairs and a pub height table for dining. The unit is on a corner, and close to the pool. You are within walking distance to the beach,so we took advantage of the beach chairs that are in the unit, in fact we didn't rent a car for our stay as you are within walking distance of everything. The one thing on a wish list (my husband's) would be a living room chair with arms. The furniture was very comfortable, but I took the comfy couch so he was stuck with the chair, lol. I can't recommend this unit enough and our experience with KWVPR has always been excellent. Jaime & Becky did everything to make our stay perfect, we will stay here again, hopefully next year!! Hello Dawn, It was great having you stay with us again and look forward to having you again and again! Happy Holidays to you and your family. Lovely condo in fantastic location. Condo amenities were even more complete than described, with nice "extra" touches like beach towels,soaps,hairdryer,a few board games,etc. A tiny part of the write-up we found a bit misleading was the claim that there is a "lovely view of Key West Harbor from the balcony." In reality (for us, at least), there is a lovely view of the condo complex's tall palms and tropical vegetation, with occasional slight visibility of the top decks of a military vessel or cruise ship in the harbor. Nonetheless, we highly recommend this tidy, pleasant condo & its spacious outdoor balcony, regardless of view. The location & parking could not be more convenient. We bicycled or walked everywhere on Key West, only using our rental car when we ventured north to enjoy other islands & state parks in the lower keys. We've already recommended this particular condo unit to friends. Liked the location. Only a couple of blocks to Duval St. Close to the beach. room was not very clean when we arrived and room needs some updating. Overall a nice area. Good communication, clear directions on paperwork, friendly and professional. The unit was clean, comfortable bed, loved the deck. Only negatives were the closet smelled like smokers were there, hair dryer only worked on low. Last year we rented a studio on the other side of Duval. It was adequate but very dark and had no windows to open and get fresh air. It was also a hike to thee beach. This year we could not have been any closer to the beach, yet all the shops and restaurants were just steps away. We loved walking down to the harbor along Emma St (one of the prettiest streets we've ever seen) and Truman Annex feels very safe and peaceful. The unit has plenty of natural light and when it was cooler at night we were able to turn off the A/C and enjoy the fresh air. I also enjoyed doing laps in the full sized pool. 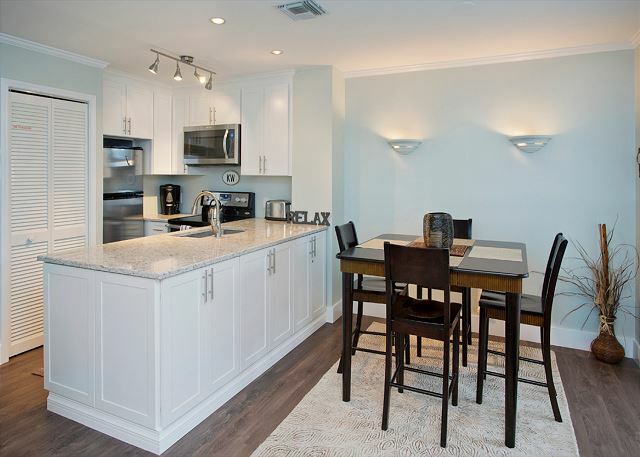 The condo was in a great location for all there is to see and do in Key West. Beautifully decorated. Loved the balcony. Our only issue was on the day we arrived. The off site management company told us they would fax over our vehicle info to the guard at the front gate so we could get our parking pass. When we arrived there was no one at the gate, just a phone number to call. We called & the guard said he would be back at the gate soon. We parked is the spot assigned to our condo, unloaded and decided to walk to the Green Parrot for a much needed drink after our 8 hour drive to Key West. It had started to rain when we walked by the guard station and told him we needed our parking pass. We were hoping that the management co had given them our information but apparently, that was not the case. The guard would not give us a parking pass without SEEING OUR CAR! So, we walked back to our car (in the rain) to drive it to the guard shack so he could SEE OUR CAR! He also needed to know who we rented from. He didn't know the management company that we rented from so he was reluctent to issue the pass. Even though this is the only issue we had, I won't be renting from this management company again. This is the fourth condo we have rented in the Truman Annex. I'll be renting from the on site rental company that we have used in the past. We loved being in Truman Annex. The condo is artfully put together and comfortable. The supplied cookware is far above average. The management company was professional and helpful. That said, it should be noted that comments by previous tenants - that tiles are cracked, the deck sooty, the dog downstairs barks every time you step on the porch - are accurate. While refurbishment wouldn't hurt, I would unhesitatingly book this condo again. We didn't have a car for most of our stay, and that was no problem with this location. The appartment was really nice, and we would definitelly stay here again if we go back to Key West. It's a great condo, everything you need for a wonderful vacation. Tucked away in the back of the complex so it's private and quiet. Thanks to the owner! Good Place! Great Location! Could use some updating. Liked the condo. Floors were not clean, though. Wish there had been bikes included. Location was super and proximity to Taylor Beach was a huge plus. Hello Elizabeth, Thank you for your feedback. We greatly appreciate it. We will let the owner know your suggestion about the bicycles. Hope to see you again soon. The rental was great but I will not be back for Fantasy Fest. Fantasy Fest has changed with fewer participants, overbearing police and a huge number of pushy Cruise Ship day trippers. My one complaint is that you only get one set of keys. The place can host four guests so if anyone want to do something on their own they cant unless they coordinate. You should have two sets of keys. Hello Patrick, We are happy you enjoyed your stay. We welcome our guest suggestions/feedback and will make sure to address your recommendation. Thank you very much and hope to see you again soon. a guest from Clancy, MT does not recommend this vacation rental. the property was in a great location, good private parking area, beachs, downtown, the unit was smaller than others, only 1 chair and table on deck, no b-q which was supposte to be there, bed room small, a few ants that is to be expected. This was our 1st stay in the Truman Annex and we definitely recommend staying here. It is a quiet location a couple blocks from Duval but close enough to walk to any interest you may have. We had a few isssues with bugs at the beginning but fortuantely these were addressed with a can of Raid. We also were missing the keys to the gates but these were quickly supplied to us. The condo is situated in a very good location and we had all of the ammenities that we needed. We will stay here again. 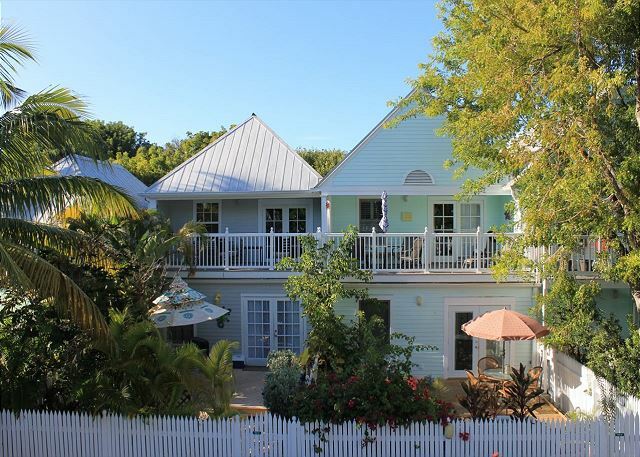 The property was very clean, quiet and close to all the fun that Key West has to offer. The balcony was probably our favorite part. 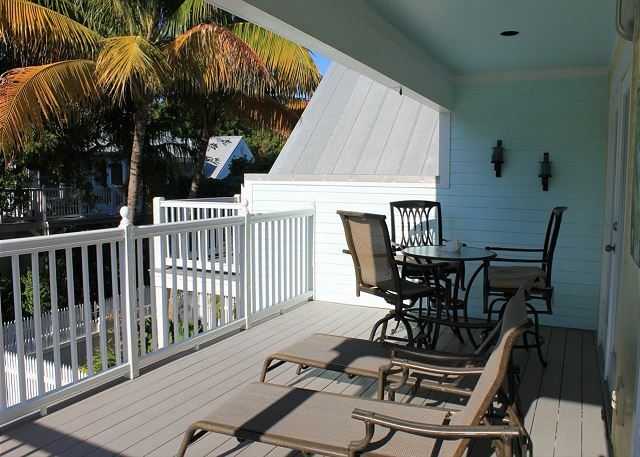 As we no longer choose to participate in the Key West night life, the balcony was a great place to sit and relax, have a few cocktails....star gaze and enjoy the warm Florida air. Thank you to the owners for sharing your little piece of paradise with us! Had a wonderful time staying at this property. The location was wonderful, not far from Duval but nice and quiet. Very comfortable bed. The only drawback was the amount of soot on the deck. Probably from the cruise ships that dock nearby. Would have been nice to have a way to clean that so the dirt wasn't tracked inside. Hello, Glad you enjoyed your stay, and sorry out the soot on the deck. We do welcome all suggestions/feedback, and this has been addressed. Thank you and look forward to having you stay with us again. Shipyard Condo in Truman Annex - Loved It! Hello Ellen, Yes, this was taken care of, and glad you enjoyed your stay. Please contact us for you 2012 stay. These units book up fast. This was a great condo located close to eveything. 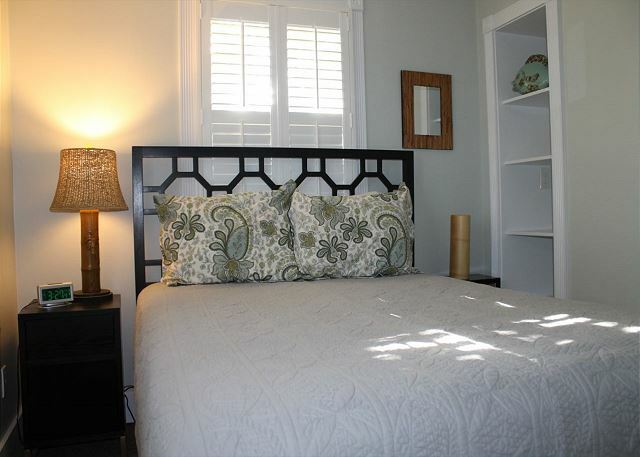 The Truman annex is a great place to stay while in Key West. This was our second stay in Truman Annex and reccomend the location to anyone. fantastic location, very clean and comfortable. will be back. Perfect stay except need a better quality bed and one that doesn't squeek and rattle at the slightest move. Otherwise couldn't have asked for a better home away from home in paradise. This place was like having a home in old town Key West a two minute walk from the Green Parrot, Hemingway House and Duval Street. Stayed here for a week with my husband. The condo is great. Exactly as shown. Wonderful location to everything. Felt right at home. Very nice to be able to cook some meals and relax on the deck. I highly recommend. Sweet stay! This is the third time that we have stayed here. We love the location, the unit is very clean, furniture is comfortable and the kitchen is well equiped. All of the staff at Key West Vacation Properties are excellent. We will return again. Close to Duval, but not so close to hear the bands or crowds. No view of the pool or beach, but you can see the Coast Guard ships fro the porch. We spent the week diving and found it a perfect place to come home. Was my 4th trip to Key West and I would highly recommend the Truman Annex as a place to stay. Excellent experience and condo was perfect for a couples get-a-way. Location was great. Condo was clean and well-equipped. Bed was squeaky, so much so it would would wake us up every time we moved. Otherwise, a wonderful stay. 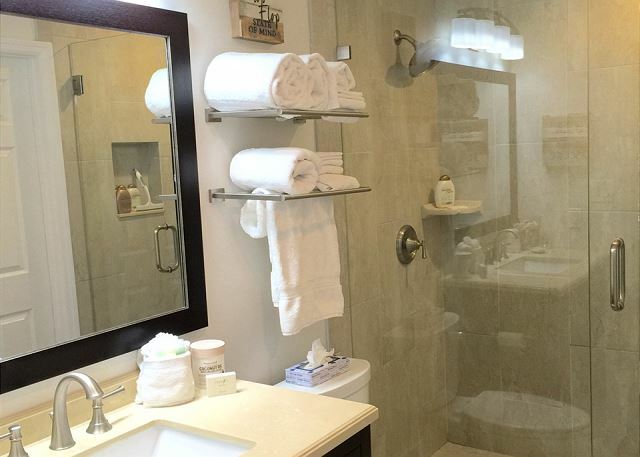 If you appreciate privacy and all the comforts of home you will enjoy your stay here! Location can't be better to take in all of the shops, restaurants and sights just 2 blocks off the midpoint of Duval Street. Hot-humid days were soothed by air-conditioning, swimming pool and crushed ice drinks by night-fall. We loved our stay in the Truman Annex; great location! We stayed for one week and were never bored (we could have stayed another week with no problem). The Condo is nicely appointed and has pretty much all you need. It is close to everything yet quiet enough to enjoy quiet rest and relaxation if desired. Perfect location, close to Duval, Restaurants and beautiful sunsets! I loved the condo. I thought there should be some beach, pool towels there and more bath towels, only 1 facecloth, other than that everything was wondeful. i would like to say that it was one of the best places i have ever stayed at. it was clean and just absolutely wonderful. not only would i recomend it to others i would definitely stay there again! 2 problems--the userID and password for the wireless did not work. We had to go to an internet cafe. Also a cleaning fee was added to the rental cost. We were told to do dishes and make sure only 1 load of laundry would be left for the cleaning person. I would never leave a rental property in dirty condition but I didn't appreciate having to do laundry.